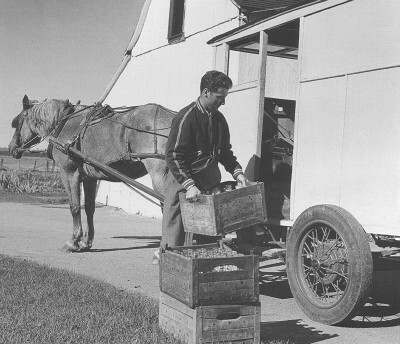 In 1953, Fernand Bourbeau loads his horse-drawn wagon to make deliveries. Champlain and La Visitation-de-Champlain are merged since 1982 to form the municipality of Champlain. Residents of this region were used to drink the raw milk from Mr. Bourbeau farm since Pasteur and the great distribution companies came and changed the way to make business.